Awarded To Caven & Associates! 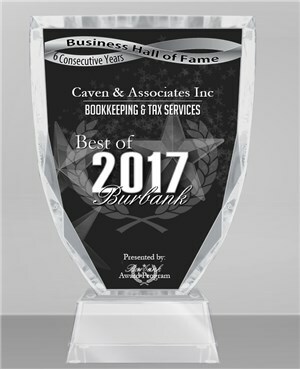 Caven & Associates Inc has been selected six years in a row for the 2017 Best of Burbank Awards for Accounting Services and now qualifies for the Burbank Business Hall of Fame. Welcome and thank you for visiting our website. This website has been designed to become a helpful resource tool to you, our valued clients, friends and visitors. Our dedication to superior client service has brought us to the Internet as we continue to provide the highest quality professional service and guidance. As you browse through our website, you will see that we have highlighted background information on our firm and the services we provide. We have also included useful resources such as informative articles (in our Newsletters section) and interactive financial calculators (in our Financial Tools section). In addition, we have taken the time to gather many links to external websites that we think would be of interest to you (in our Links section). Please feel free to contact us with any questions or comments you may have – we would love to hear from you. We pride ourselves on being proactive and responsive to our clients’ inquiries and suggestions. Tax Season is right around the corner so make sure you call now to set up an appointment. We recommend you call as soon as possible even though you may not have all of the necessary information to prepare your return. © 2019 Caven & Associates, Inc.